Day Two of our great weekend anniversary getaway was more subdued than day one. We walked around Forsythe Park and saw some wonderful statues including the one here of Colonel Francis Bartow of the Confederate States of America. 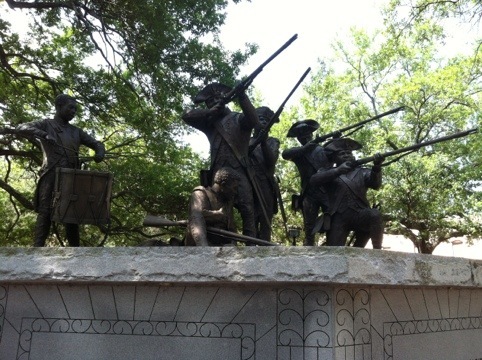 A fascinating piece of information about the statues in Savannah is that all of them are facing their aggressors. For example, all Civil War battle monuments are facing the north. Near the City Market area, we met some old friends who were also here for the weekend. Having been to Haiti, the Haitian Monument next to the city market was extremely fascinating. During the Revolutionary War, many Haitians fought with the colonists to help us gain our independence. That is utterly fascinating to me as I did not know that. The detail in this sculpture is fascinating. 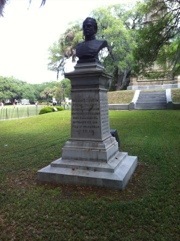 Of special note, Henri Christophe, depicted as the drummer in the monument, fought in the war and later became King of Haiti after he led them in their independence from France. 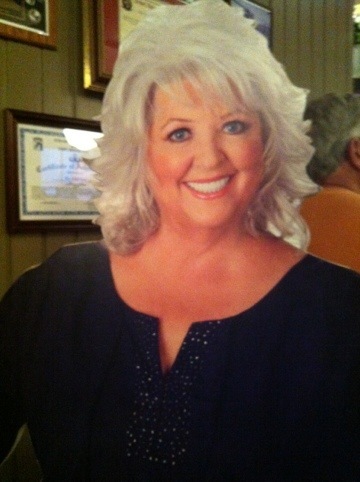 Paula Deen was happy to greet us! Later in the day, we went to Paula Deen’s The Lady and Son’s restaurant. It was worth the wait as the southern cook was as good as advertised. Later we returned to the hotel and jumped into the hot tub to relax and unwind. Tonight we plan on going to the River Street for the nightlife. Details will follow tomorrow. Enjoy! We had originally planned to scour River Street, however halfway between there and our hotel was the City Market area which appeared to have a vibrant night life of its own. There was a live band in the market place and several bars and restaurants were outside in a cafe type configuration. We started at Pour Larry’s, an underground Pub, and then went to the Wild Wing Cafe to devour numerous wings and libations while still listening to the band. A good time was had by all and that’s all I can say about that. Enjoy! Posted on April 14, 2012, in Travel and tagged Travel, Vacation. Bookmark the permalink. 2 Comments. Where are you staying in Savannah? How is the traffic? Was it difficult to navigate to downtown? Have you taken the trolley? 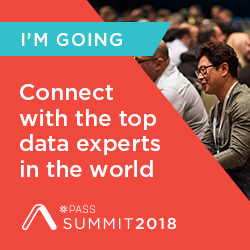 Did you do any tours you would highly recommend? Did you do the night time ghost tour? Interested in details of River St nightlife. Spring Hill Suites in beautiful Historic Savannah. Traffic was not bad at all and it was easy to find. We saw the trolley but it is only on River Street. We did the ghost tour which was fun but not as good as the one in St. Augustine. The tour we did was Oglethorpe but we talked to some others and they all sound the same. It was good but different than St. Augustine where you could get on and off anywhere and resume the tour. Here you have to listen to the tour all the way through and then they drop you off at the City Market. From there you can grab a tour bus around to wherever you want but it was not as efficient as the St. Augustine ones that were constantly moving on the same route. There were designated stops, but we had to call them twice and waited over 30 minutes at one location before a bus came. Staying in the historic district we would probably not do the tour again after doing it once because you can walk everywhere especially if you stay in the center. We toured the River Street area but the City Market area was closer to our hotel so we enjoyed its vibrant night life.